I am not always a view seeking hiker, but when I am, I go to the Columbia River Gorge for quick views. Indian Point is best accessed from the Gorton Creek Trail a few miles east of Cascade Locks. It involves almost 3000 feet of elevation gain, so it’s a good workout, but the mileage is only 8 miles round trip, meaning it’s only a half day affair. 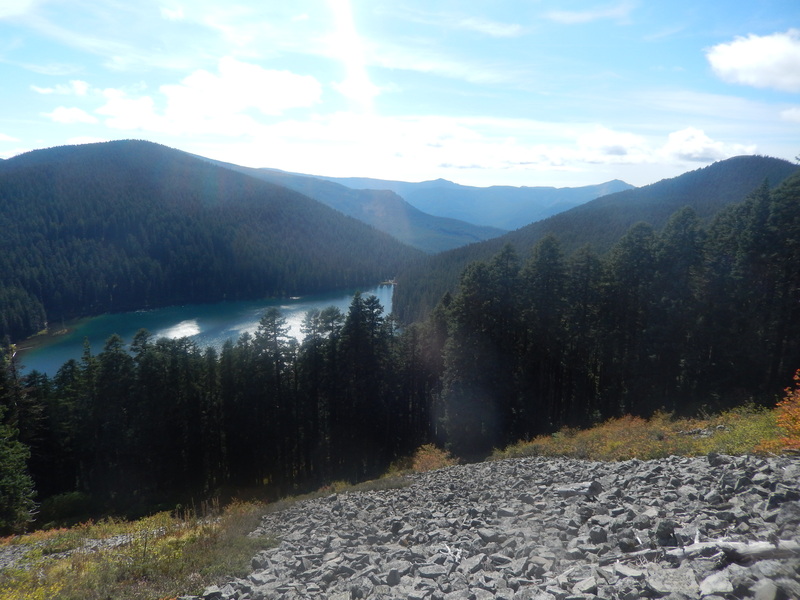 The hike through a Douglas Fir forest is pleasant but unexceptional. There are no significant views or landmarks as the path steadily climbs. Just less than four miles uphill, I was ready for a view. An unofficial spur trail leads downhill to Indian Point. This is where things start getting good, although it is definitely not for inexperienced hikers. The trail drops steeply, but not for long, and then it winds out to a narrow talus ridge with a rocky point capping the end. 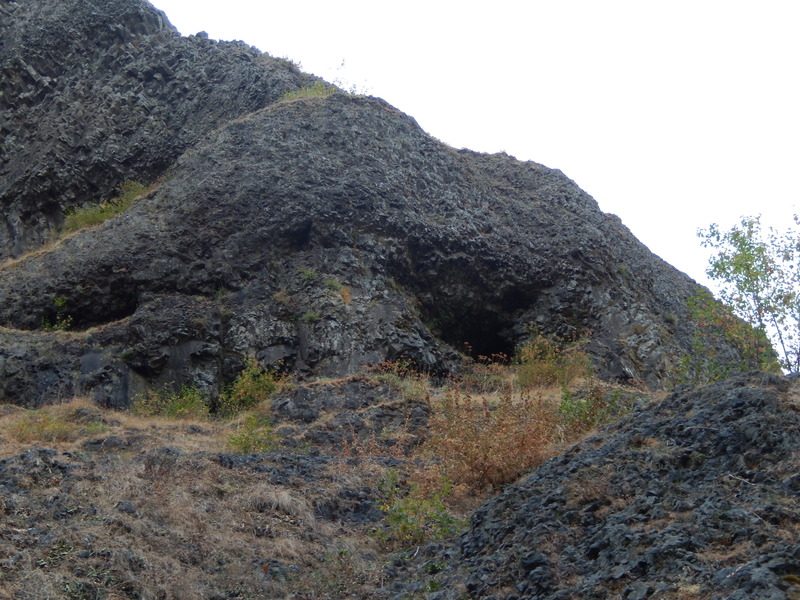 The point is comprised of shattered loose basalt. Jackie Chan and I opted to hang out in rocks below and enjoy the views. It was gorgeous and serene. Looking upstream a bit toward Wind Mountain and Dog Mountain was spectacular. In the distance to the north, Mt. Adams looked huge. I could have stayed there forever. When I heard a couple people descending from the main trail, I knew it was time to go. On the descent, I looped back via the Nick Eaton Ridge trail. It offered some nice steep meadows with views towards Mount Hood. Other than that, it was not graded as well, and I slipped on some steep gravelly terrain. By then, I just wanted to get back to the car. And so I did. Mission accomplished. 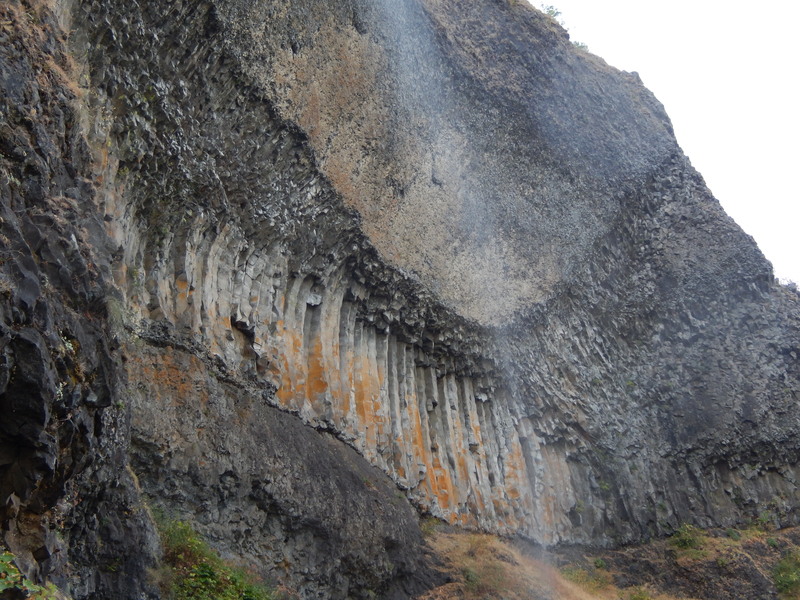 I was pleased to find yet another hidden gem in the Columbia River Gorge. Indian Point is a keeper. 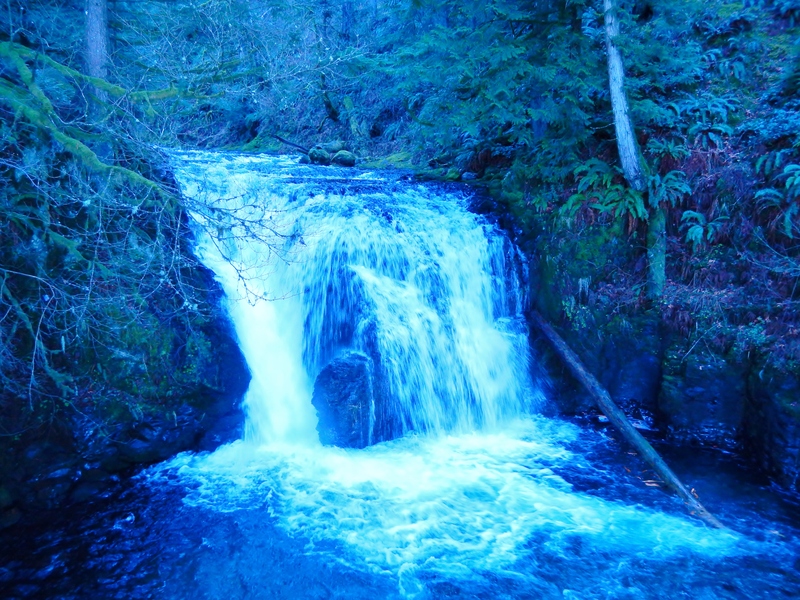 As I headed back towards the Portland metro area, I felt rejuvenated by my hike. It’s finally summer, and I am ready to hike. A year ago I looked at hiking to Wauna Point, but it didn’t pan out because I didn’t have a good map or guidebook. This year, that wasn’t a problem. As I am working a new job that only allows me one day off a week right now, I was very focused on getting in a good hike today. It had been far too long. 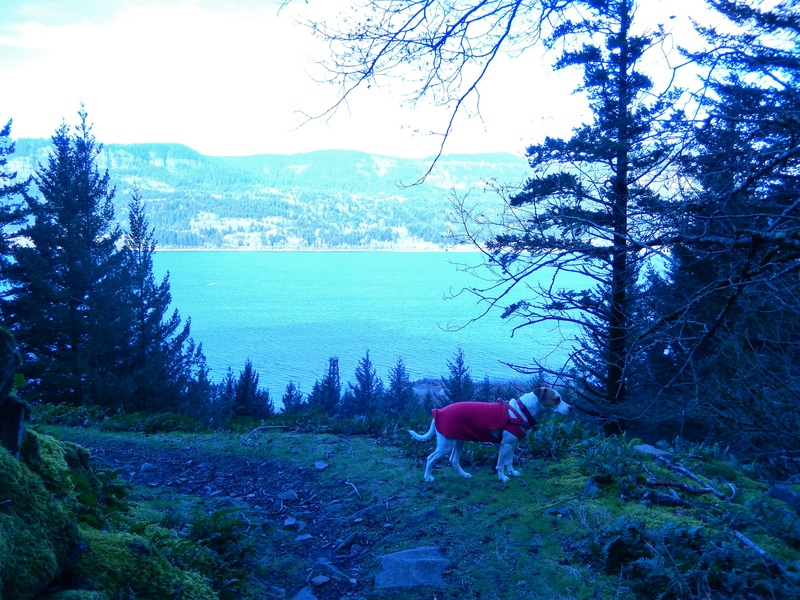 I took my faithful canine hiking companion Jackie Chan with me and headed to the majestic Columbia River Gorge. Unfortunately, I was delayed by a traffic problem. Two lanes of the three lane highway were closed. It was backed up for three miles. Ugh. Still, I managed to be at the Tooth Rock trailhead by noon. I opted for a simple route via an access road past a couple junctions. The road curves about two casual miles uphill to the old Tanner Butte trailhead. I’d climbed Tanner Butte as a teenager. Now it’s a sixteen mile adventure. Not for everyone. Wauna Point, on the other hand, is a relatively modest ten miles, the last leg of which is very rugged. More on that later. Beyond the old tiny trailhead, a path continued upwards, briefly following a beautiful stream. Multiple wispy cascades drape the drainage within a quarter mile, after which the trail veers away from the small canyon. 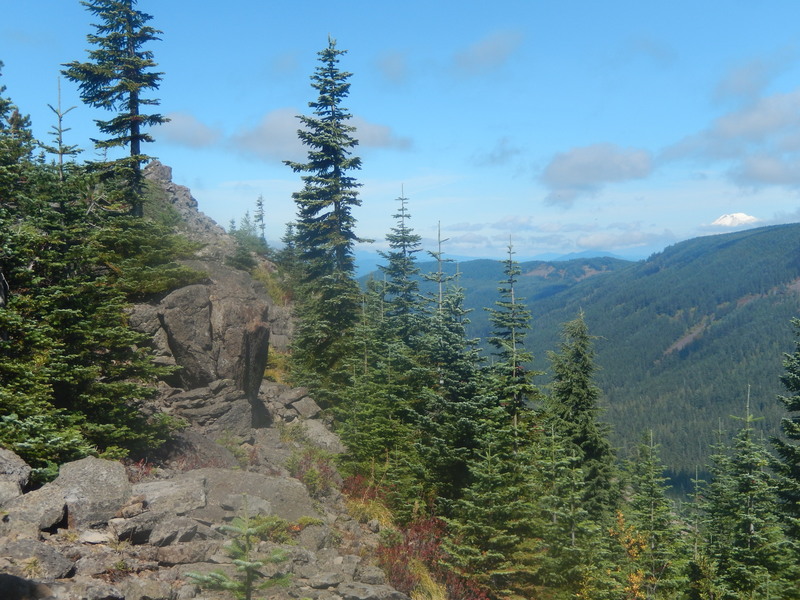 The landscape along the trail is typical western Cascades: lush, green, and viewless in the lower elevations. It is also relatively people free. 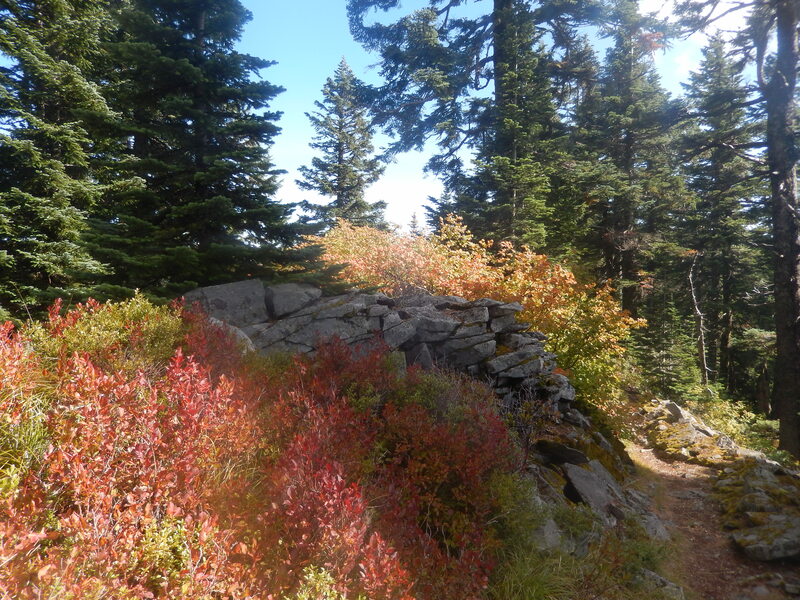 One guidebook as well as a hiking website refer to the Tanner Butte trail as steep. It certainly forges uphill steadily, but it rarely felt steep. That’s not to say it wasn’t challenging. Whooee, my legs are gonna feel it, I recall thinking. Eventually, after climbing to a landscape of salal and fern undergrowth with stately evergreens overhead, the trail flattens briefly at a junction. To reach Wauna Point, one goes straight ahead on an unmaintained trail. Due to dense damp ferns encroaching on the path, my boots and legs were soaked in a few minutes. Despite the dampness, this secondary trail seemed easy. It descended the far side of the ridge, dropped beneath a rocky rampart, and then plunged down a very narrow ridge via some very steep, scrabbly and muddy spots. This is not for the casual hiker. Good traction and balance are necessary. I used my hands a few times. As always, descending a steep bit is the tricky part. Once I was down into a little saddle, the rest was relatively easy. I eventually sat on an airy perch, the Columbia River undulating like a shiny snake 2500 feet below me. I kept Jackie close by my side. Wauna Point is not a place for a pup to be a squirrel chasing spaz. 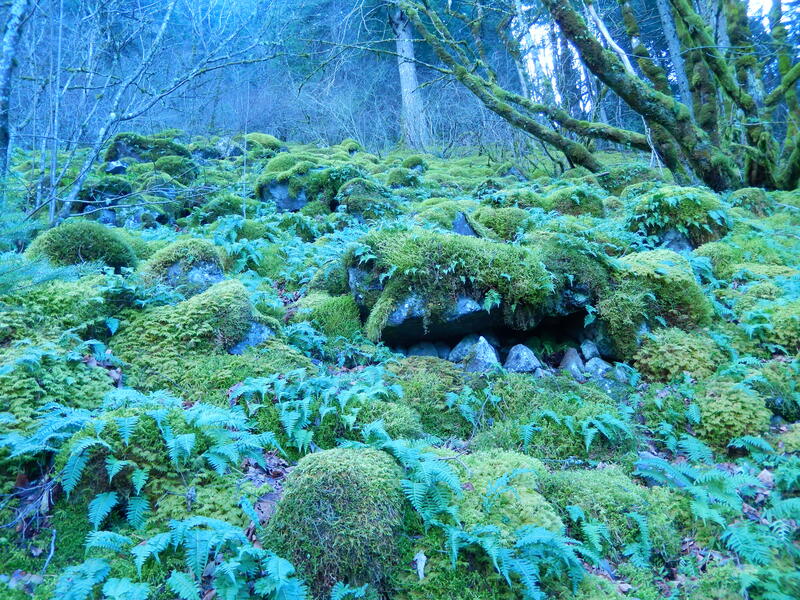 It is fairly rocky, and only a few feet wide, with some exposure in places plunging hundreds of feet. Wauna Point is a notch below the best viewpoints of the Gorge, largely because its views are dotted with manmade structures like Bonneville Dam, the Bridge of the Gods, and the buildings of a couple towns. Still, it was pretty great, especially the unique horizontal perspective of the bare, steep flanks of Munra Point, which faithful readers may recall I climbed last July. The way down was quiet and relatively quick. In all, I took just over 5 hours for the round trip of 10 miles, with some extended relaxation on top. I might be a touch sore tomorrow. This was a great first serious hike of the year. Hopefully there will be many more great hikes forthcoming. Ah, summer! 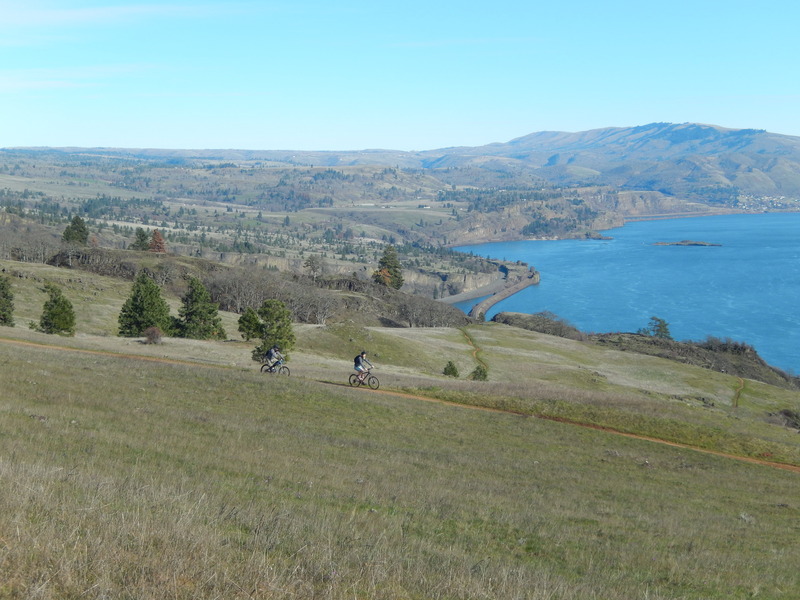 View of the Columbia River from the Gorge Trail. Early in January, a falling boulder seriously damaged the Benson Bridge at Multnomah Falls east of Portland. Naturally, when I headed to the gorge Sunday for a hike with my pup Jackie Chan, I forgot this. Why does it matter? It matters because you cannot take the traditional trail to the top of Multnomah Falls, and hikers have to be happy viewing the falls from below with the tourist hordes or hike to the top from a different direction. Instead of linking Multnomah with Wahkeena Falls, where I been relatively recently, I drove further east, almost to Oneonta Gorge. An obvious pullout lets you access Gorge Trail #400, which traverses the base of the gorge hills for miles. I walked west on that trail until it connected to the Multnomah Falls trail in a mile or so after some pleasant wandering through the woods. All of it is mostly a mellow grade after the climb away from the road. From the trail junction, the trail went through about a mile of switchbacks to the top of the ridge, a bit further than I remembered, although it is not very far in the greater scheme of things, and it is never difficult. There are a couple nice views of the falls along the way. Eventually a short offshoot takes one to the lookout spot, nicely fenced in for Jackie, so I didn’t have to worry about him. The switchbacks are relatively easy since they are mostly paved. They are also numbered, which I found amusing. Eleven. Then you pop over the top of the ridge and into a lovely creek drainage. I saw no other hikers on the ascent, which I am sure would not be the case when the Benson Bridge is open. The creek and lush foliage above the falls. I admired the view for a few minutes and gave Jackie a snack. I decided the mini falls fifty feet above the big boy plunge were quite lovely. I passed two guys on the return leg and made it back to my car in plenty of time to get home before the Super Bowl. I would recommend this hike to someone who wants a moderate hike with some elevation gain. It will probably see very little traffic until the bridge is fixed.